The autumn of 2011 has entered the record books as one of the warmest Nov/Dec couplets on record for the Northeastern part of the United States, along with much of the Great Lakes and Eastern US. The unfortunate aspect about this excessive warm period is the fact the snow totals have been extremely low, to nil, across much of the Northeast corridor. This is not a coincidence. The global regime in place for Nov-Dec was one which favored a low height field surrounding the north pole, and plentiful high/positive heights in the mid latitudes. While Alaska has been getting pummeled with snowstorm after snowstorm, the United States has been experiencing quiet, tranquil, undisturbed weather overall, with very few major storm systems to talk about. Now that this period is largely behind us, I think it’s important to examine potential reasons for why this occurred. 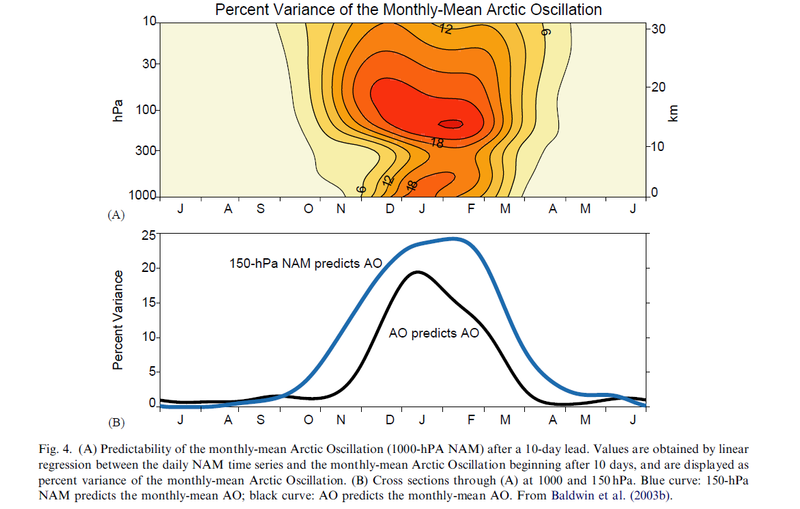 Why did the Arctic Oscillation (AO) shoot way positive after two consecutive years of very negative values? Why was December the polar opposite of most weak/mdt La Nina Decembers? Rather than cold dominating the Plains, Lakes, and New England, we saw an extended autumn, with birds chirping, grass growing, and flowers blooming, up through Christmas this year. It’s my opinion that the chain of reactions/interactions that led to the pattern of Nov/Dec 2011 can ultimately be traced back to the behaviour of the Sun. In the years of 2009-2011, we continued to see a deep minimum in terms of solar values – geomagnetic activity (i.e, Ap index), solar flux, sun spot number (SSN) were all very low. However, during autumn 2011, solar flux values spiked upward, with numbers surging all the way from 25-30 up to as high as 180 on the dalies by early November. Geomagnetic activity, while low overall, also saw a relative spike during this time frame. Note on the following graph, courtesy of climatedata.info, the transition from very low solar flux to much higher values later in the year 2011. I believe solar behaviour can modulate the wind patterns and anomalies of the thermosphere, mesosphere, stratosphere, and sometimes all the way down through the troposphere. There are time frames where the conditions are more “ripe” for solar patterns to impact troposphereic circulation patterns. In this case, higher solar flux values (and heightened solar activity in general) began to affect the wind anomalies of the upper stratosphere in the equatorial regions. These wind anomalies interact with planetary Rossby waves (waves which form from air flowing over continents/land masses, and often propagate from the troposphere up through the stratosphere), and are drawn north toward the pole, eventually propagating downward in the stratosphere. There, they can enhance/strengthen the stratospheric vortex, or weaken it, which then, often fortells the behaviour of tropospheric patterns like the AO and NAO. The intensity of the stratospheric vortex has a fairly high correlation with the tropospheric vortex (which modulates AO values). When the strat vortex is powerful, the troposphere tends to follow suit, and vice versa. 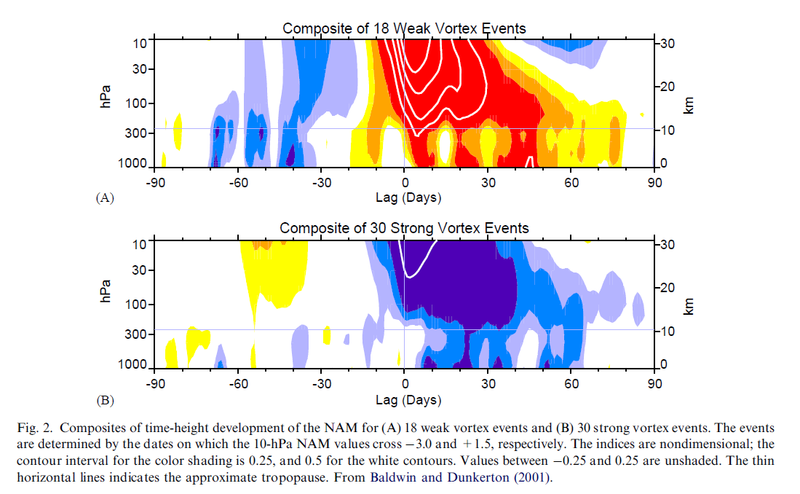 The Northern Annular Mode (NAM) is an index utilized to measure the intensity of the vortex in the stratosphere; there is also a surface NAM, measuring the tropospheric vortex strength (this is very closely related to the AO). The important thing to take away is that a strengthening vortex, or POSITVE NAM in the stratosphere, often precedes a positive NAM and strong vortex in the troposphere. The same can be said for the opposite case – weakening vortex in the stratosphere corresponds to weakening vortex in the troposphere. These strong and weak vortex events tend to persist about 2 months, which we’ve experienced this autumn. The strongly positive NAM / vortex event initiated in early November, and is likely finally weakening now that we’ve surpassed the 60 day mark. Note the following graph of strong/weak vortex events (weak vortex events coinciding with stratospheric warming, by the way). In the following graph, one can see the predictability of the stratospheric NAM for the surface NAM. As is always the case, meteorology is extremely complex, yet everything is interconnected. When we thrown the Quasi-Biennial Oscillation in to the mix (QBO), it gets more interesting. The QBO involves wind patterns in the stratosphere of the equatorial regions. As mentioned before, since this is a stratospheric oscillation, the QBO is probably modulated by spikes and declines in solar activity. The QBO has two distinct phases – the westerly (positive) phase, is a more regular, undisturbed wind pattern, whereas, the easterly (negative) phase is more irregular, and tends to disturb the stratospheric vortex, causing it to weaken. However – West and East QBO’s can have very different effects depending upon the time of the winter season. 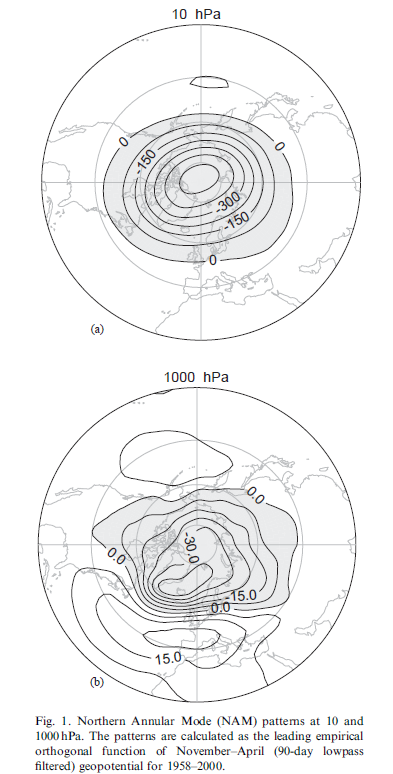 The solar–>stratosphere–> troposphere connection tends to be enhanced in early winter during West QBO events, and that same connection is enhanced in late winter during east QBO events. Note in the following graph, that in times of westerly QBO and low solar flux, the NAM tends to be more negative in the early winter. When the QBO is westerly with high solar flux, the NAM tends to be neutral or positive in early winter. Then in the mid to late winter, when we have low solar flux and easterly QBO, the NAM tends to be lower/more negative. When the solar flux is high with an easterly QBO, the NAM is more positive. Thus, this combination in early winter is quite conducive for a positive NAM, which translates to a positive AO and stronger than normal vortex in the troposphere. We’ve seen the effects of this w/ the resultant weather – very cold over the northern latitudes and but warmer in the mid latitudes. The bottom line to all this — the forcing responsible for the Eastern US’s miserable late fall/early winter thus far possibly originates with higher solar activity (especially solar flux) which was able to influence wind anomalies in the stratosphere, interact with the westerly QBO, in turn strengthening the stratospheric polar vortex, meaning a positive NAM, and a strong tropospheric vortex. The West QBO allowed the heightened solar activity to propagate from the equatorial stratosphere to the pole and downward through the troposphere, influencing circulation patterns such as the AO and NAO. The QBO is now reversing negative, and solar flux values are lower than they were the past couple months. The strong vortex event has already lasted more than 60 days, so it’s unlikely that a strongly positive AO will continue the rest of the winter. Whether a negative AO will initiate is another question entirely. This post’s purpose is meant to examine potential reasoning behind the strong vortex event of autumn 2011/Dec 2011, which consequently led to the blowtorch warmth and snowless conditons in the Eastern US.